Jamin Buchanan Wilson went from being named homecoming king at D'Evelyn High School in Golden to becoming a leader of his Air Force command in Germany in a span of seven years. First Lieuenant Wilson loved helping people he encountered during his service in the Air Force, his college years at Harvard and his high school years in Golden, his family said. To his friends and relatives, the 25-year-old with a catching smile was known as J.B.
"He found joy in seeking things to be excited about and then sharing it with others," his father, Charles Wilson, said from his home in Virginia. First Lieutenant Wilson was killed on December 14, 2006, near Speicher, Germany, on his way to the Spangdahlem Air Force base when his car slid into a cluster of trees. Those who served with him joined his family in a memorial service at the Spangdahlem base on December 19, 2006. He was buried at Arlington National Cemetery on December 26, 2006. He was a commissioned officer in the U.S. Air Force and had been stationed at Spangdahlem since 2004. 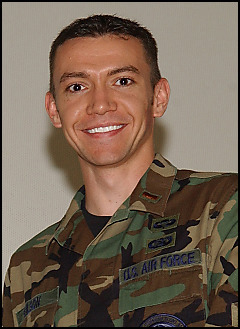 In 2006, he was promoted to First Lieutenant and assigned to serve as Deputy Flight Commander of the Network Control Center at the 52nd Fighter Wing's Communication Squadron. First Lieutenant Wilson was posthumously awarded the Air Force Commendation Medal for his exemplary work as the deputy flight commander of information systems. He received several service awards and commendations. From the time he was a toddler, First Lieutenant Wilson had a "curious intuitive mind," his aunt, Kathy Wilson, said. She recalled when he was 3 and got his hands on a screwdriver. "He dismantled the entire doorknob," his aunt said. "He just wanted to figure out how it worked." His patriotism and leadership abilities also surfaced early. "In elementary school, he was selected to oversee the raising of the flag, and he surprised everyone. They'd never seen anyone get the kids in a straight line marching toward the flag," his father said. First Lieutenant Wilson was born January. 9, 1981, in Englewood, Colorado. He attended D'Evelyn High in Golden, where he was involved in music and theater. He received an ROTC scholarship to Harvard, where he earned a bachelor's degree in computer science. "He always took advantage of all the opportunities offered to him," said Ryan Browne, a friend of First Lieutenant Wilson. After graduating from Harvard in 2004, he enlisted in the U.S. Air Force. During his service in Germany, he worked in the base's Web services and was later assigned as the officer in charge of Air Traffic Control and Landing Systems. In a December 14, 2006, letter to First Lieutenant Wilson's parents, Lieutenant Colonel Kevin Bennett described him as a "rising star with impeccable work ethic." "Those whom he led looked up to him because of his caring leadership style, dedication, and loyalty. He had a knack for bringing out the best in people, fostering teamwork and motivating those around him," the Colonel wrote. In a 2005 article featured in an ROTC newsletter, First Lieutenant Wilson wrote about spending St. Patrick's Day in Dublin, snowboarding in the Austrian Alps, hang-gliding over Swiss lakes and running with the bulls in Pamplona, Spain. "His enthusiasm for mundane things in life was contagious," his father said. First Lieutenant Wilson cherished his family. Along with his will, he left behind a letter. "Please don't be sad," he wrote. "I guess maybe it's ridiculous to ask that, but I couldn't have asked for a better life. I was blessed with the most incredible loving family and wonderful friends, was able to see and do things that most people only dream about, and died doing something I loved and felt was important. So be happy and enjoy life - I sure did." His family plans a Denver-area service at 2 p.m. Saturday at Southern Gables Church, 4001 S. Wadsworth Blvd. in Lakewood. In addition to his father, First Lieuenant Wilson is survived by his mother, Rebecca, of Virginia; his sisters, Molly, of Hot Springs, Virginia, and Brynna, of Charleston, South Carolina; his brother, Parker, of Los Angeles; and his grandmother, Martha, of Lakewood.